software enables you to easily view, comment, modify and print an extensive list of file types like PDF, DWF, TIFF, PLT, and more, that are associated with the architecture, engineering, construction, and manufacturing design workflows in today's business environment. With a streamlined interface that makes it easy to use, yet very powerful, AcroPlot Matrix doesn't get in the way of getting work done. Users can quickly open and add comments or stamps to files, insert, reorder, rotate, or delete pages, and even merge various file types into a single PDF or DWF. Printing files to scale at full or reduced sizes that are dimensionally accurate is now possible in AcroPlot Matrix by using the "Custom Scale" option in the printing dialogue window. 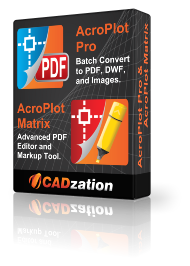 While other PDF and DWF software applications only print to either "No Scale" or "Reduce to Printable Area", AcroPlot Matrix provides the functionality to define a true reduction percentage so that output to any printer at any scale is now possible -- half-size prints are now quick, easy and accurate.